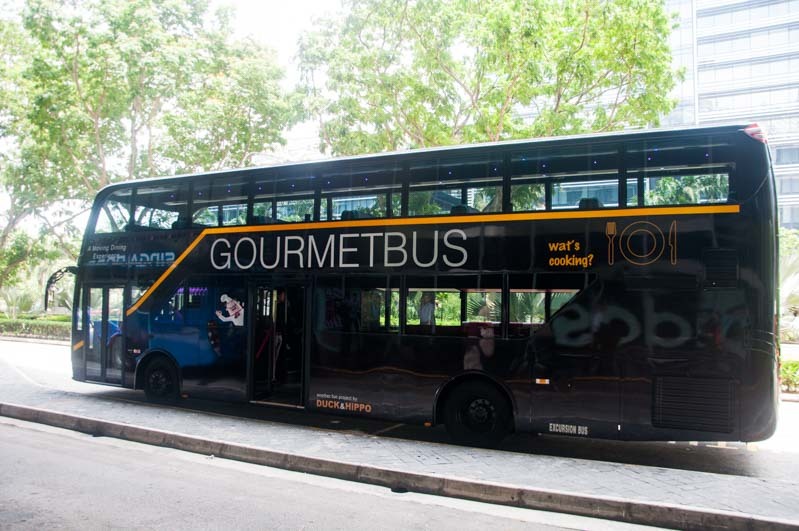 The Gourmet Bus is a novel dining concept (a first-of-its-kind in Asia) that offers us common folk the opportunity to feel slightly touristy and more classy in an edgy sort of way, on board a bus that serves both food and Singapore’s most scenic, urban views. For two hours, one can spend a romantic date or an interesting business lunch on a bus customised specially to let people dine comfortably in their seats whilst being mobile. 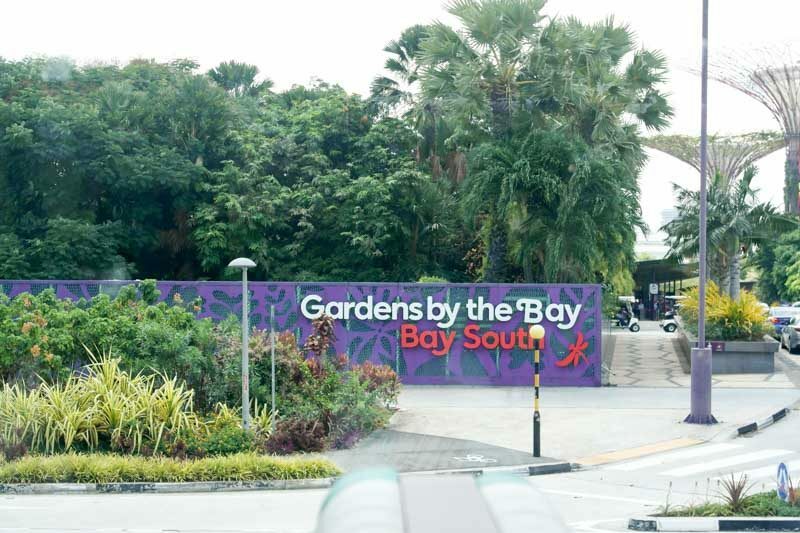 At one point, the bus even makes a stop at the well-adored Gardens by the Bay for a good thirty minutes of roaming about amid lush trees and greenery. 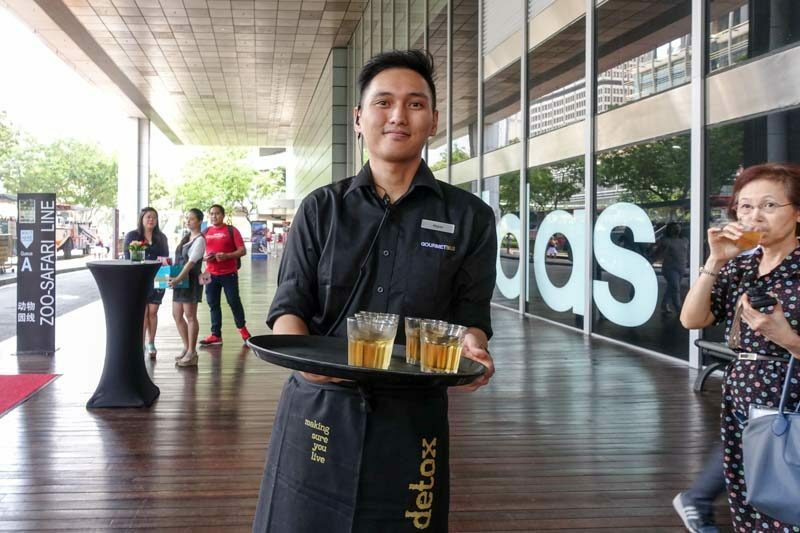 We headed down to Suntec City at about 1200 to catch the Gourmet Bus for its lunchtime showing at 1300. 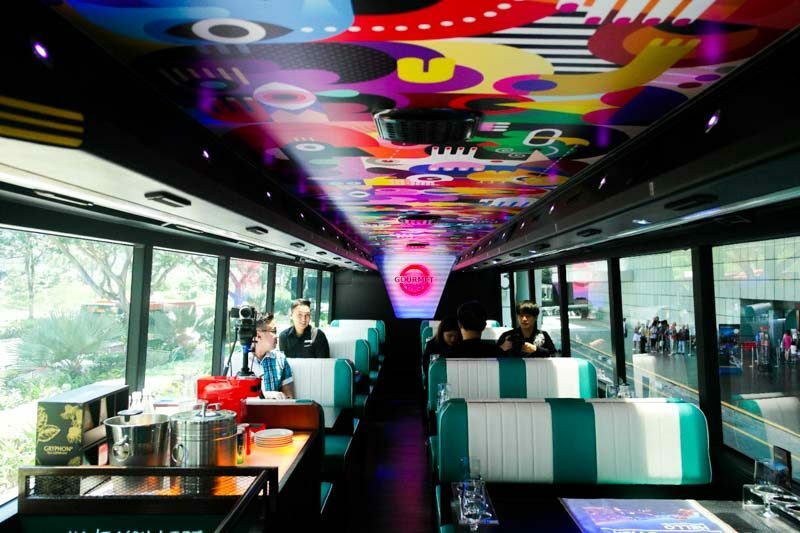 When we arrived, we sat around for a while before the bus promptly arrived at 1300, impressively decked out with two storeys and with a bold imprint on the side of the bus, making it known that the Gourmet Bus was there and ready to get going. Before we got on board the Gourmet Bus, a coy but warm server brought glasses of chilled apple juice for us to cool off with. We quickly downed the drinks and excitedly made our way to the double-decker bus. Once on board the Gourmet bus, we were greeted with clean and plush, leather seats in bold red and white covers that ran from the entrance of the bus to the end, where a television hangs. This area is wheel-chair-accessible and would also make for the perfect spot for anyone looking to host a late-night party of sorts on board a bus. 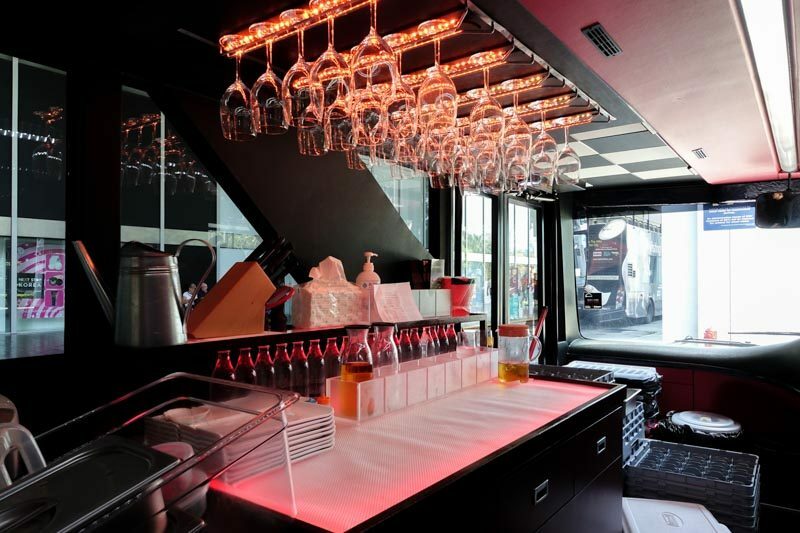 The front section of the bus which is where the trusty driver sits along with the prepped dishes, utensils and drinks, impresses with how securely the utensils and glasses are kept in place. The driver has to be extra careful when driving and he does a fantastic job too since throughout our entire journey, not a single “clank” or “clink” from below was heard. The second floor opens up to a more spacious area, with a rather retro-looking get-up. The ceiling is adorned with a vibrant and playful piece while the jazzy tunes played over the speakers help put you into a jivey sort of mood. The seats are well-spaced out and they are very comfortable, regardless of where you may choose to sit. 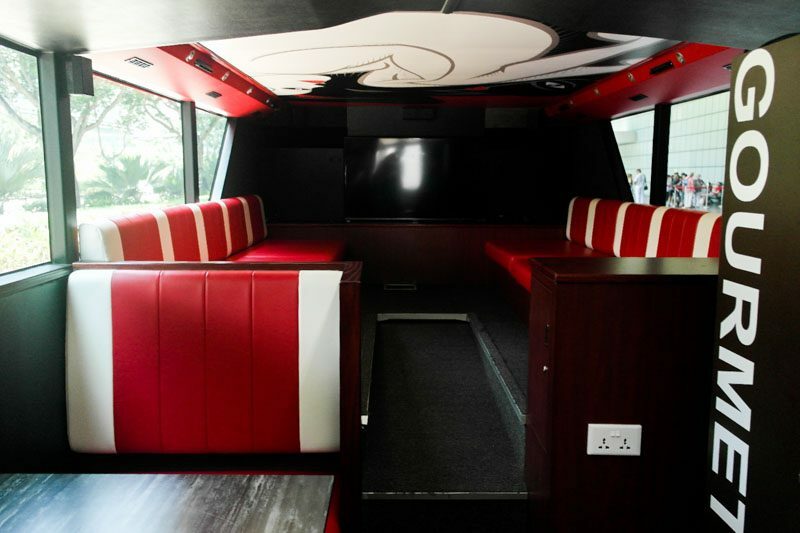 One impressive feature of this Gourmet Bus is that each table comes quipped with a fully-functioning projector and with a blank piece of cloth on which slide shows can be projected on to. It is undeniable that a gourmet bus such as this one would make for a unique and perfect setting for a business meeting over a meal. The route the bus takes can also be altered so if there is a structure within the area that the host would like to shows his/her associates, it is completely possible with the bus! 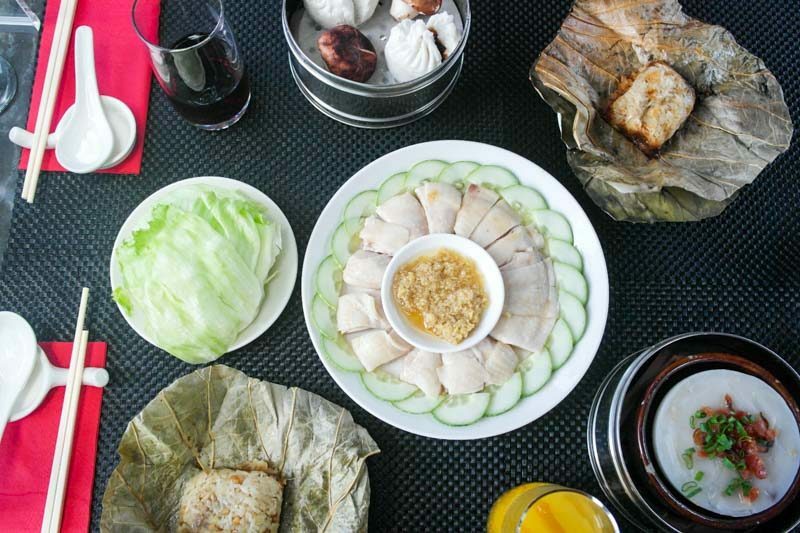 The Gourmet Bus currently serves two particular meals – the Dim Sum Lunch and the IndoChinese Dinner, with two more dining tours, the Singapore Brunch and Peranakan Hi-Tea, which will be in effect rather soon. 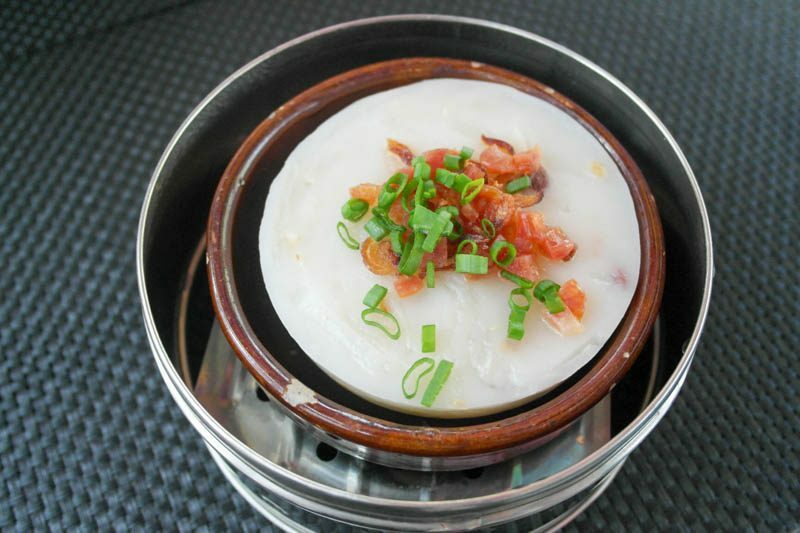 The Dim Sum Lunch that we went for is $57 per pax and is served from 1300 to 1500. Served with an optional add on of $13 for free-flow drinks, we had a seemingly simple and rather delicious meal to keep us full and well throughout the ride. 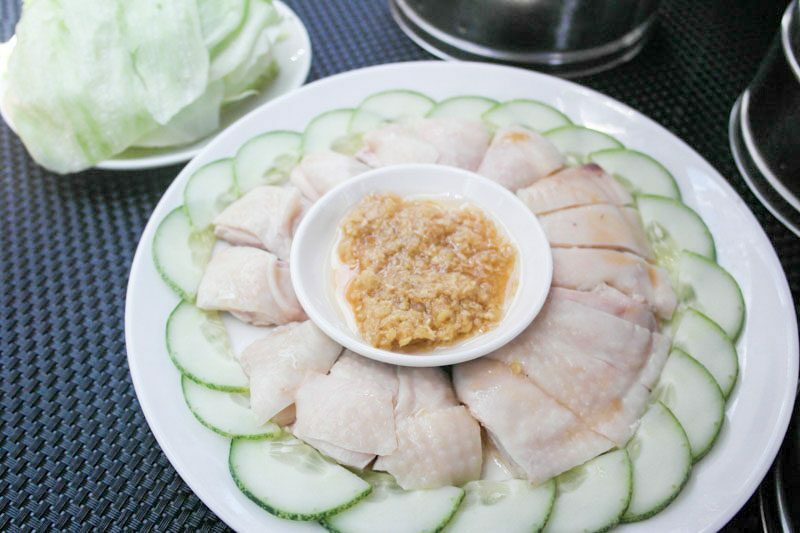 The first dish mains dish that was served to us was the Samsui Ginger Chicken, which is a highly refreshing dish of tender chicken pieces, complete with skin that comes with cucumber slices and a side of savoury ginger sauce. While I was slightly disappointed that this dish was not served with rice but instead, lettuce, I was pleasantly surprised when I realised how the chicken tasted wonderfully fresh and succulent especially when had with the crunchy lettuce. Now, having earlier been slightly let down that there was no rice, my qualms vanished instantly when I realised that the Dim Sum lunch would consist of a good amount of carbs. We had Carrot Cake which does not, in any way, resemble the beloved carrot cake we have in our hawker centre, but was absolutely delicious in a subtle sort of way. The wobbly carrot cake was topped with chewy bits of chinese sausage and shallots and its insides were randomly stuffed with bits of meaty chunks. It was an overall very scrumptious dish and in a way, a healthier option for a carrot cake. This next Dim Sum dish was one of my favourites. 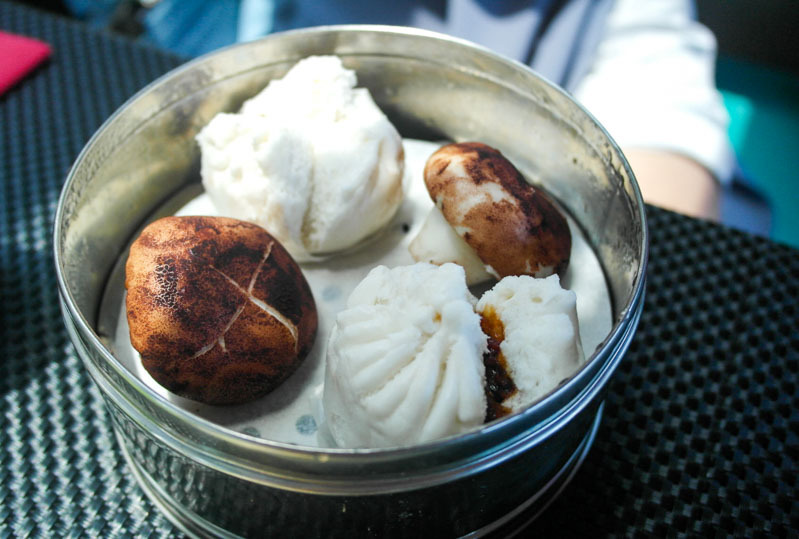 There are two different types of buns served – the Mushroom Bun and the Char Siew Bao. 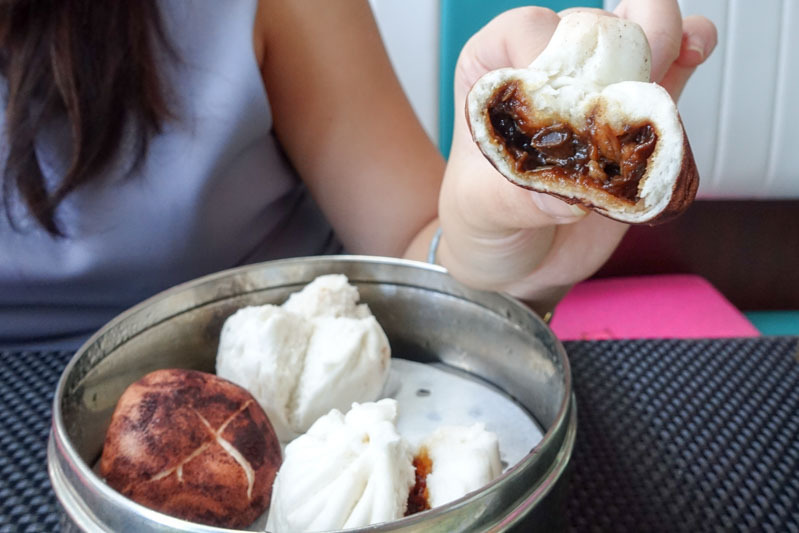 I loved the Char Siew Bao what with the filling oozing with sweet and savoury pork bits and the bun being soft, pillowy and tasty. While it may be that the buns were not served steaming hot (since no food can be cooked on the bus directly and must be pre-cooked and delivered to the vehicle), they were still absolutely scrumptious. I found the mushroom-looking bun to be especially intriguing since the chef took special care to make the buns look like actual mushrooms. The insides of this bun revealed a saucy, relatively syrupy filling stuffed with shredded mushrooms and while there was a distinct mushroom taste, the sweet bun helped to mellow the flavours out nicely. 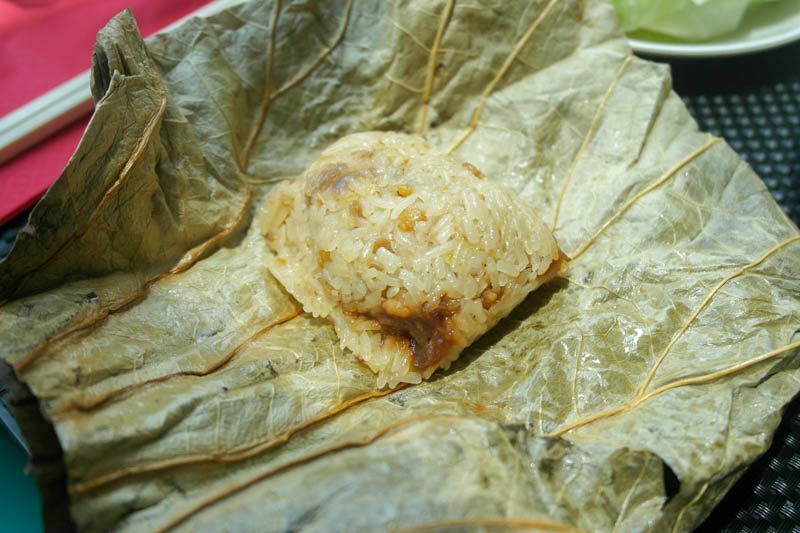 The last “Dim Sum” dish we tried was the Lo Mai Gai which came nicely wrapped up in lotus leaves. The glutinous rice was well-stuffed with savoury chunks of chicken and the steamed, sticky rice was easy to cut into and munch on. I loved this dish not only because I had my fill of carbs but because for this modest portion, I was quickly satisfied with each delectable bite. 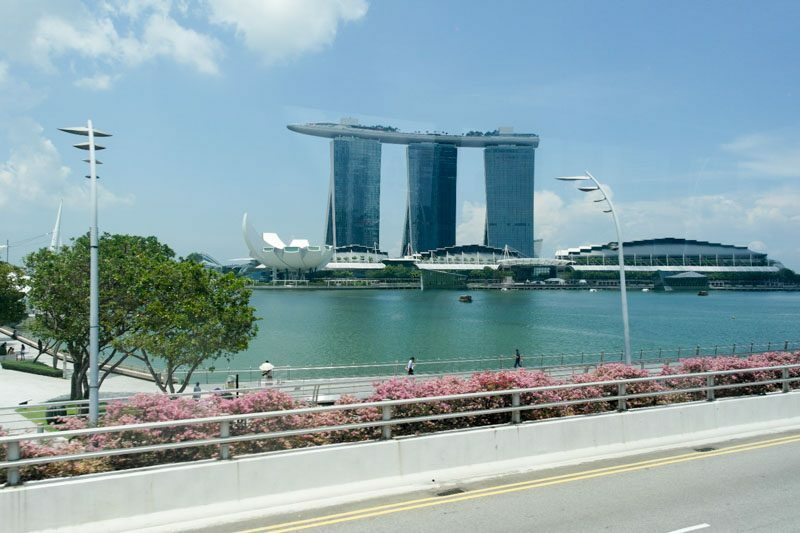 And here is just one of a few shots you can get of Singapore’s city while roaming around on this bus. Do not get too frantic with your cameras and mobile phones though, since the bus will be sure to drive by nice and slowly, giving you just enough time to snap a shot. Here is another view of the scenery outside, from within the Gourmetbus. If you and your mates run out of conversational topics, all you have to do is look out the window and pick up on something you see and go on from there. 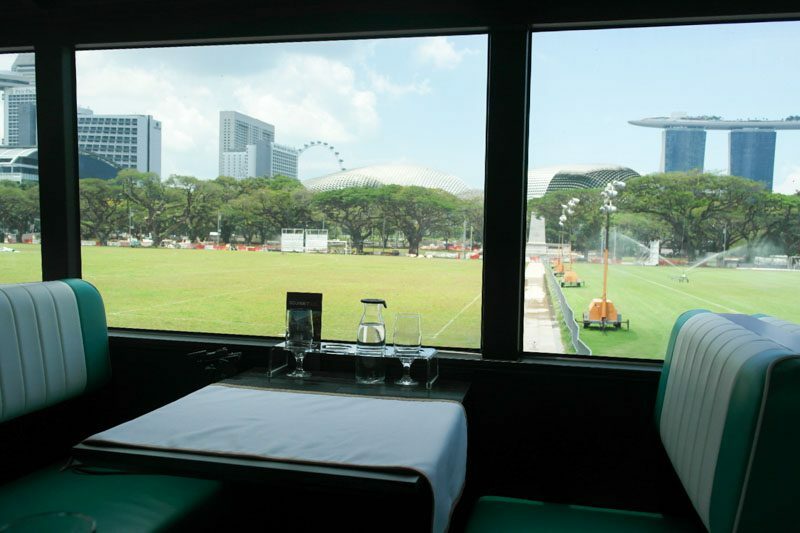 After the main course has been served, the bus will stop at Gardens by the Bay for at least 30 minutes, giving you enough time to wander around amongst the towering trees and giving the servers on board the bus to clear your tables for dessert. At night, for the dinner showing, diners can even catch the lights show at Gardens by the Bay, which makes for a picture-perfect evening, no? After all the necessary pictures have been taken and after you have taken in a good amount of good views, you can simply get on board the Gourmet Bus again and settle in for dessert. 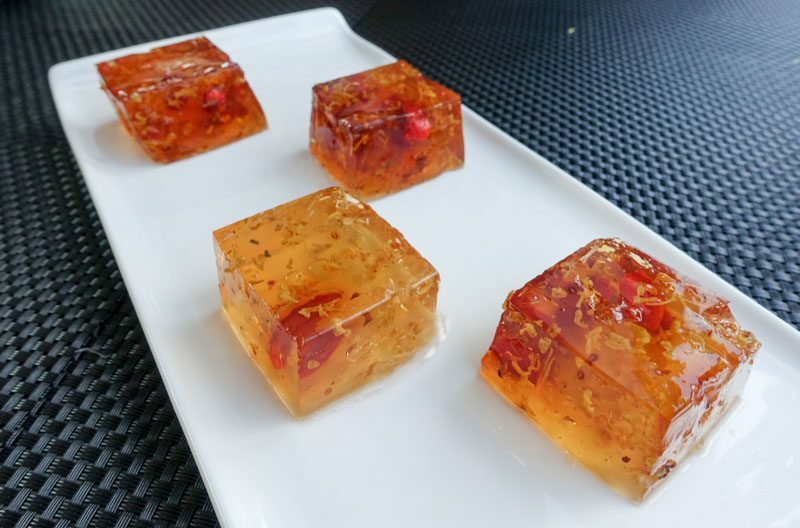 We had Osmanthus Jelly with Wolfberry which I found to be a very interesting dessert dish. The jelly blocks had a fragrant, floral smell and had a sweet, herbal taste to it. The chewy bits of Wolfberry and flowery bits in the jelly only sought to make the dish better. 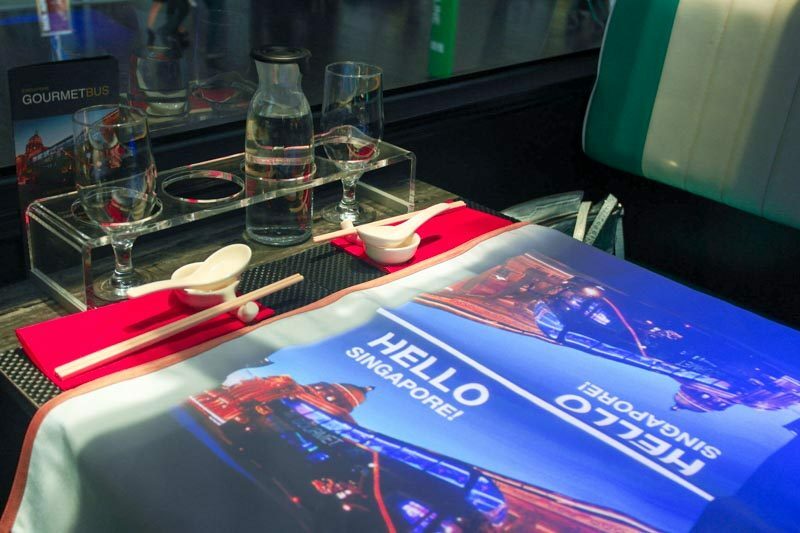 When the Gourmet Bus eventually returned to Suntec City, I was slightly disappointed that it had come to an end so quickly but I knew that past a certain point, the novelty of this moving dining experience would slowly wear off. But nonetheless, while I was on board the bus, I enjoyed myself thoroughly since I always appreciate lovely sights and substantial, good food. I aim to return with my family and possibly more friends the next time I come on board this marvellous bus. Do book early to avoid any potential disappointment, though!